The dreaded Imperial Stormtrooper is the front-line trooper in the Imperial Army. Fearless, combat-hardened, conditioned to ignore losses within their own ranks, the faceless armor-clad Stormtrooper is the harbinger of death for countless worlds that are brought under the tyrannical heel of the Empire. Bandai’s snap-fit kit is crisply molded in white and black styrene. 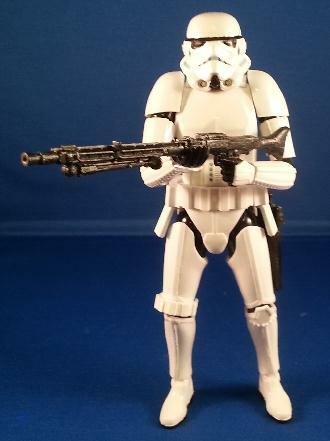 The Stormtrooper features interchangeable hands for grasping weapons, and also has a fitter base for display. Also included are three different weapons: 1) Standard E-11 blaster, 2) DLT-19 Heavy Blaster Rifle, and 3) Close Combat Pistol. Both waterslide decals and stickers are included for the markings on the helmet and armor. NOTE: The helmet detailing marks the model as being the version seen in The Empire Strikes Back. The cheek vents on the helmet are the biggest clue. The vents on the helmet in Episode IV (A New Hope) and Episode VI (Return of the Jedi) were black. Only the helmets used in Episode V had blue vents. However, the mouth decals in the kit are from Episode IV, as they are two-tone black and gray. The helmets in Episode V had solid black mouths. This is a simple “fix” to make it accurate, as the builder can just paint the mouth black and not use the kit decals for this area. 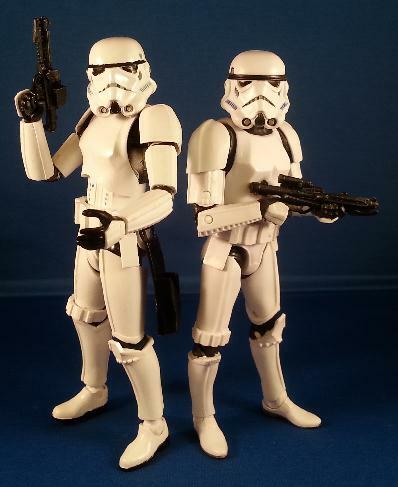 The completed Stormtrooper kit is about ¾ inches shorter than the Bandai Darth Vader kit, meaning the trooper is about 5.8 inches tall. The photo below (borrowed from thefwoosh.com) shows the height difference between the kits. I can’t wait to build this kit, but I need to pick up another Stormtrooper kit first. I have the Bandi Darth Vader kit as well, but he is going to look lonely with only a single Stormtrooper standing behind him! Here are some photos of my completed build-up. And here are a couple of shots alongside the Hasbro 6-inch Black Series action figure. The figure is on the right in the photos. I'll update this post with build notes as soon as I get a chance. Be sure to check back!